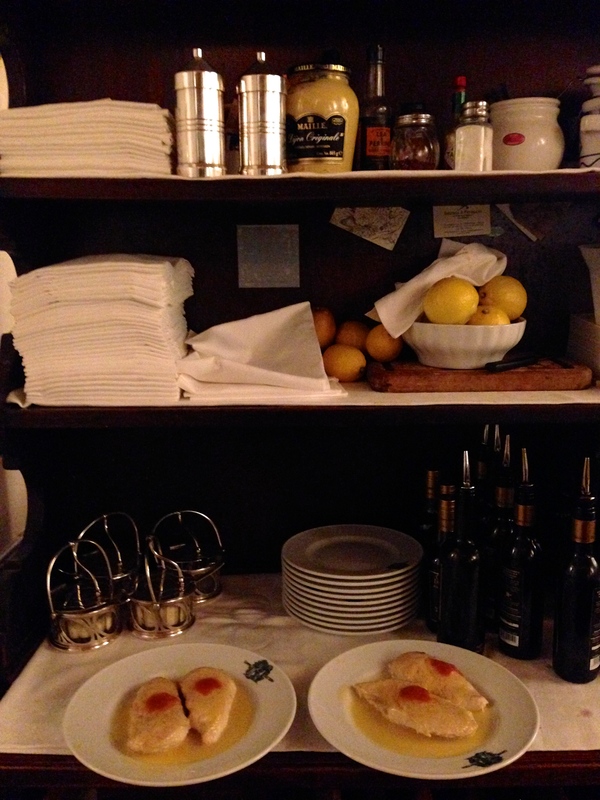 Setting la tavola at Cammillo. Starting a conversation with an Italian is as easy as breaking bread. My excitement for arrival in Florence builds as my ears fill with the sound of la bella lingua. Why shouldn’t the adventure begin at the gate? As an added benefit, I can practice my Italian before landing. Ten minutes later, we have made a few new Italian amici, Florentine natives who quickly discover that they have a few friends in common amongst themselves. 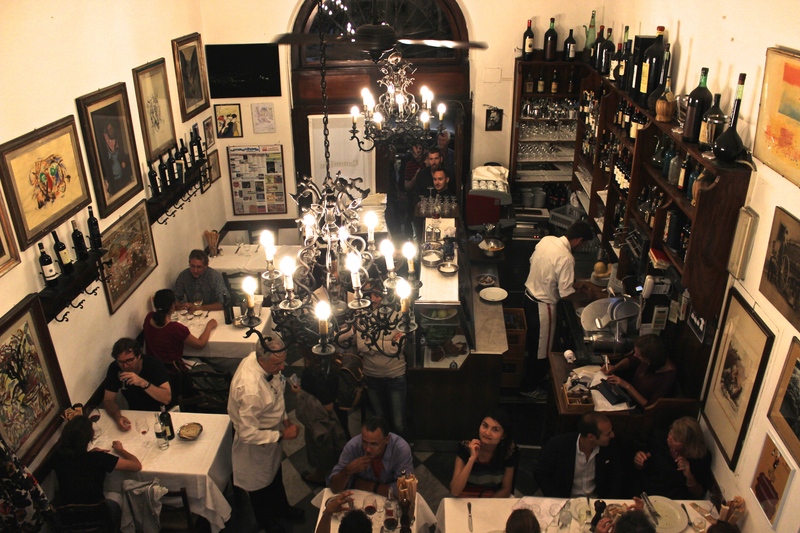 They patiently listen to me run through my list of restaurants in the centro storico, and they offer their opinion on those that they know. 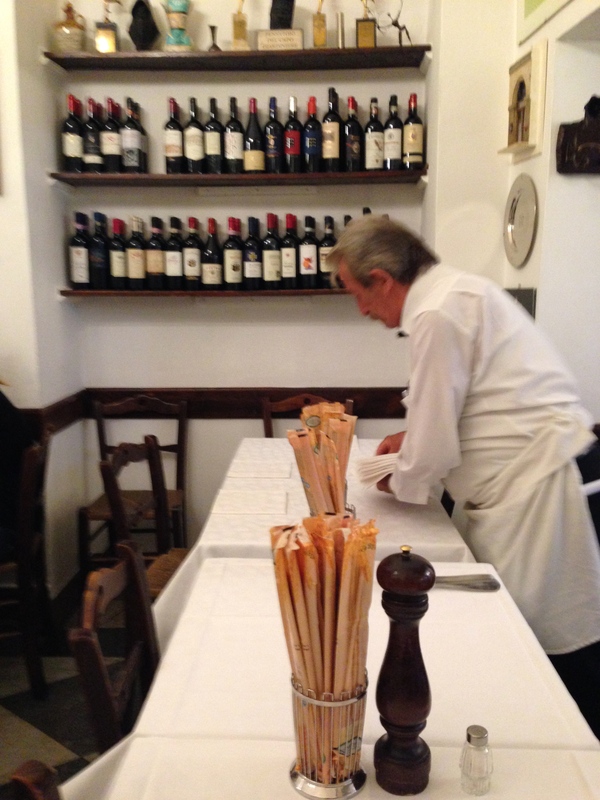 One ever so friendly gentleman, flying home to Florence with his teenage son whose face lights up when offered a biscotti, suggests one of his favorite trattorie, Cammillo, instead of the more upscale restaurant I had reserved for that evening’s dinner. I email our hotel immediately (Firenze Number Nine), to seek their help in making the last-minute switch. We arrive at about 8, early for Florentines, but the restaurant is already packed and a line has formed at the door. 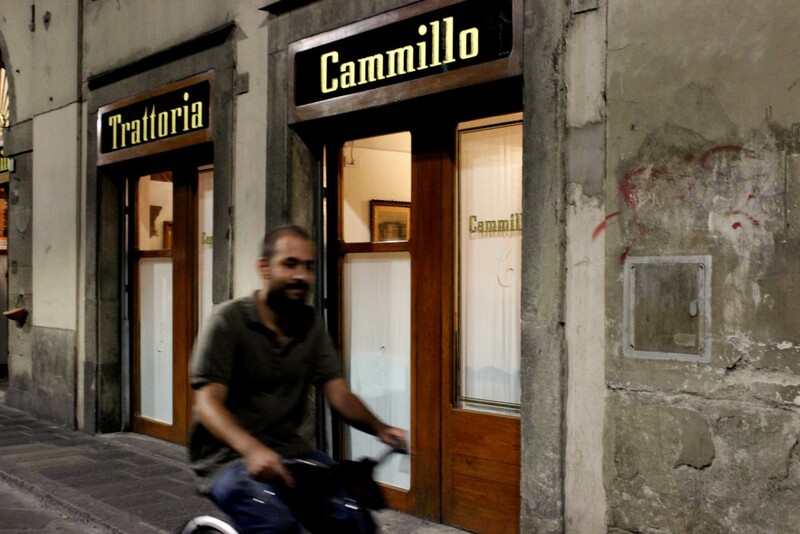 We politely ‘permesso‘ our way through to Chiara, whose grandparents opened Cammillo in the 1940s. She runs it now with her ever-so-polite and subdued husband, who travels through the rooms with a humble smile, quietly observing and ensuring the satisfaction and joviality of his patrons. 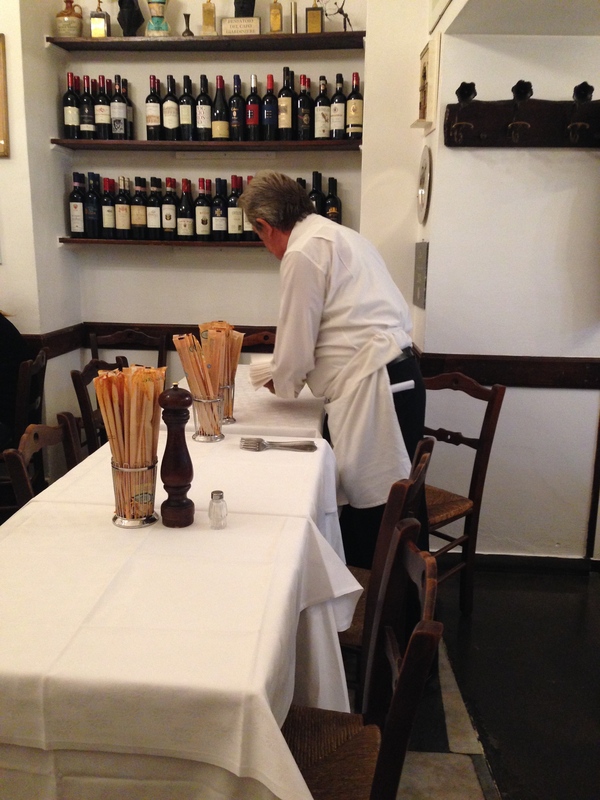 The restaurant is buzzy, the servers spend ample time with each table but work quickly between orders, and diners range from tourists from all corners of the world to local father and daughter, all prepared to dine on simple yet flavorful Tuscan fare in a hectic but convivial setting. The prices are moderate and the menu is massive. Pasta choices are endless, but after chatting with Chiara, I go on her suggestion to order one of the six or so plates of the day. 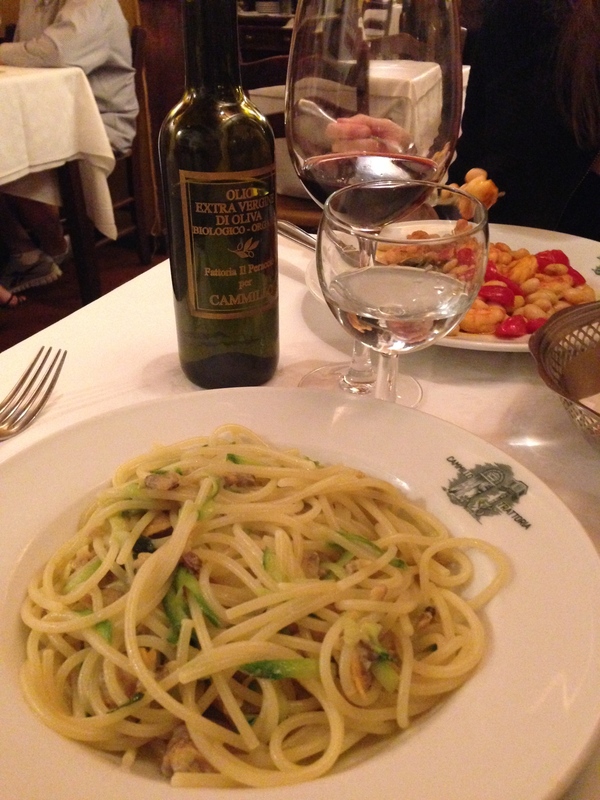 This evening the pasta is linguine with a sauce made from three different varieties of clams, fresh from the Tuscan seaside, and zucchini from a nearby farm. 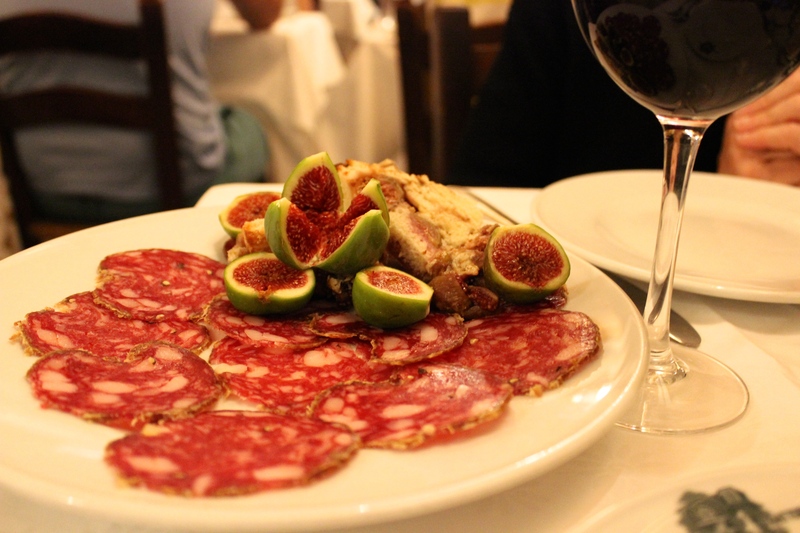 After glimpsing a board of salami and succulent figs pass by our intimate table in the second room, we opt for the ficchi as well. Figs are one of my absolute favorite foods, (if you follow my instagram, you know that during the summer months my feed is a repetitive assortment of figs), and as they are a fleeting specialty, not even available via importation in the off-months, I know that I will be savoring the last of the season’s figs for the duration of the week. 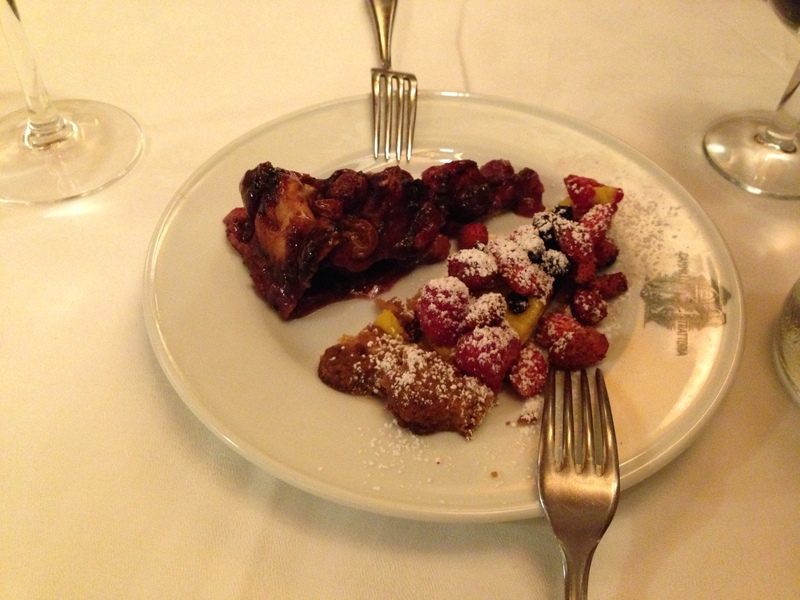 The aforementioned fig dish arrives, and I devour the Italian green fruits with their juicy, garnet-colored centers. There is also a sort of toasted bread/fig creation; a delectable specialty that we use to soak up superb Tuscan olive oil. My mamma orders the fagioli with pomodori and shrimp. 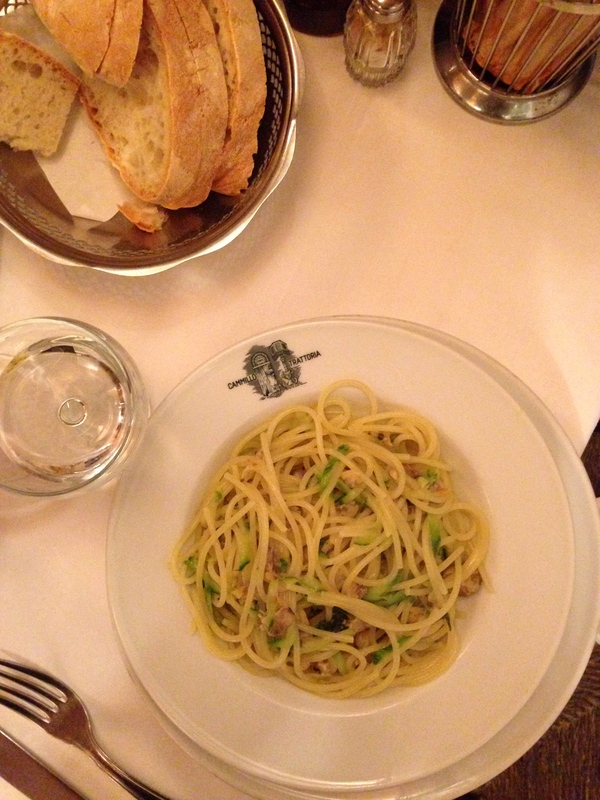 It is simple and good, but I prefer my perfectly al dente linguine. The flavors and texture of the clams and their sauce are outstanding; not overly salty, not overly fishy, not overly chewy. I clean my plate, knowing full well that I could handle a second bowl. 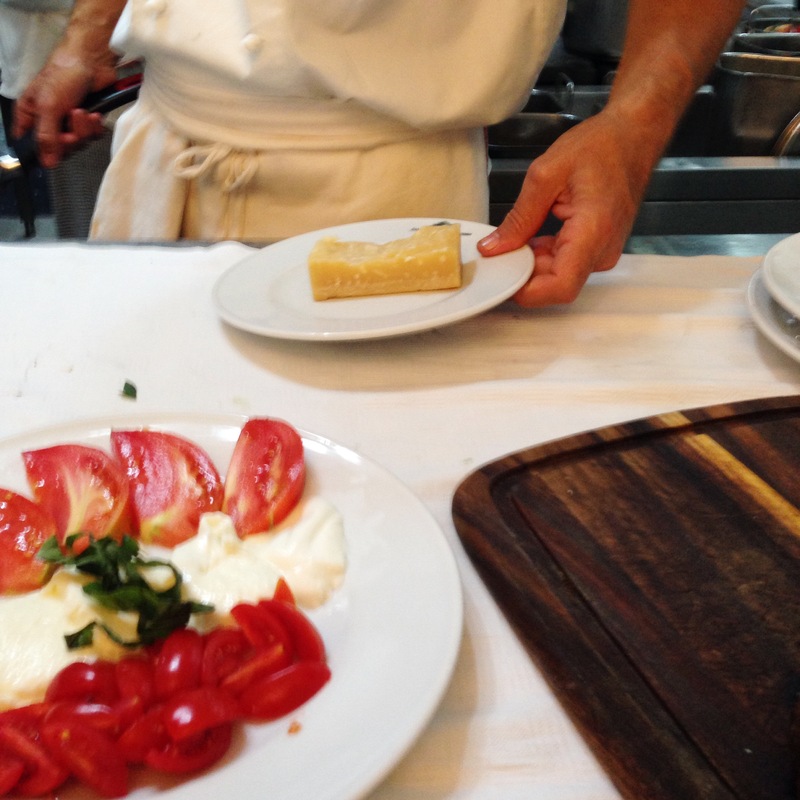 For dessert, we turn to our amiable waiter, who has only one suggestion: the torta di schiaccata con l’uva. This Sangiovese grape tart is a Tuscan specialty. The grapes are in high form in September, and my mom’s sweet tooth leans towards the tart. I am intrigued by the crostata with frutti di bosco, as my sweet tooth is somewhat more traditional, and I am determined to eat every last summer berry before the first freeze. As a solution to our indecisiveness, we order meta e meta, half of each, the most genius idea that should be used for all dessert menus across the world. 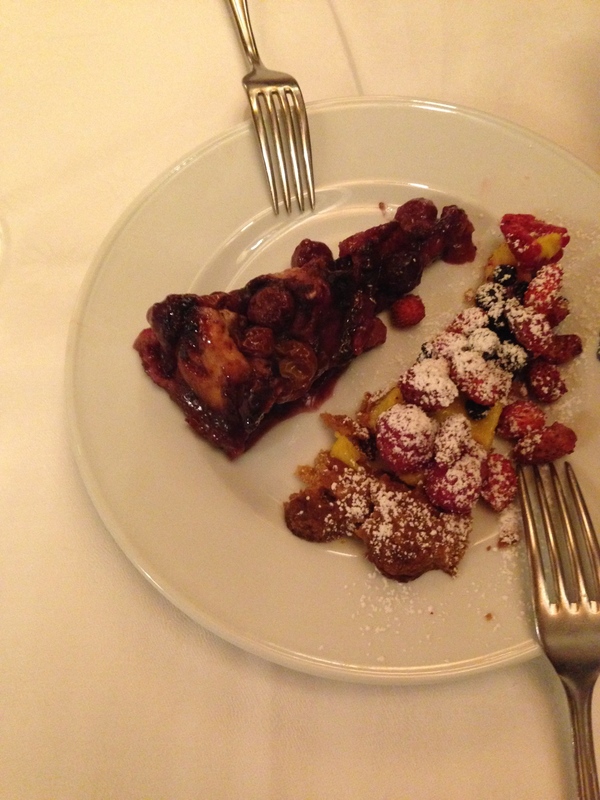 We are more than satisfied with both tarts; they are each some of the best dessert we have had in ages. The flaky crust is baked to perfection, the grapes are tart, the berries are sweet and juicy, and the custard is thick but not too rich. The last bites are gone in sixty seconds, and we could easily have more. Our waiter laughs and finds another fast solution: the other meta e meta. Chiara and her husband check on us during our dinner, and Chiara, as sweet as could be for the matron of a highly popular, ever-busy trattoria, has more than enough time to proudly show me a few highlights of her family’s restaurant. She points out a paw-print on the arched ceiling, and she tells me the story of how the 15th century brick was not yet set when a dog walked over it. She walks me upstairs to the intimate room overlooking the double-height main dining room. She even allows me to photograph her good-humored chefs in the open kitchen. 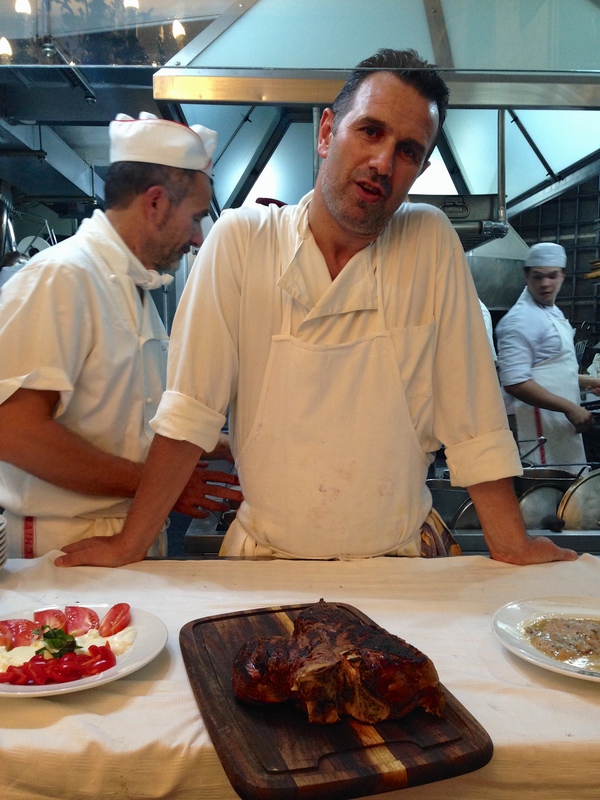 I step to the side as servers dart past me with thick wooden boards laden with bistecca all fiorentina, grande enough to make the table legs wilt. With a soft voice and the most pleasant demeanor, Chiara gives us a kiss on each cheek and thanks us for choosing Cammillo, a show of genuine appreciation that sets the pace for the week ahead. 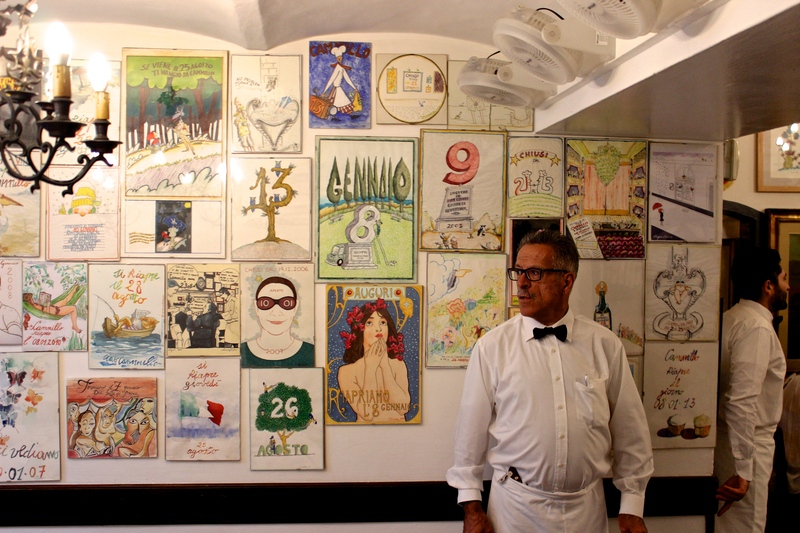 Not only are the Florentine people generous with their time and conversation, they are sincere and heartfelt in their interactions and relationships- no matter if you are strangers at the airport gate or well-acquainted patrons at a trattoria. 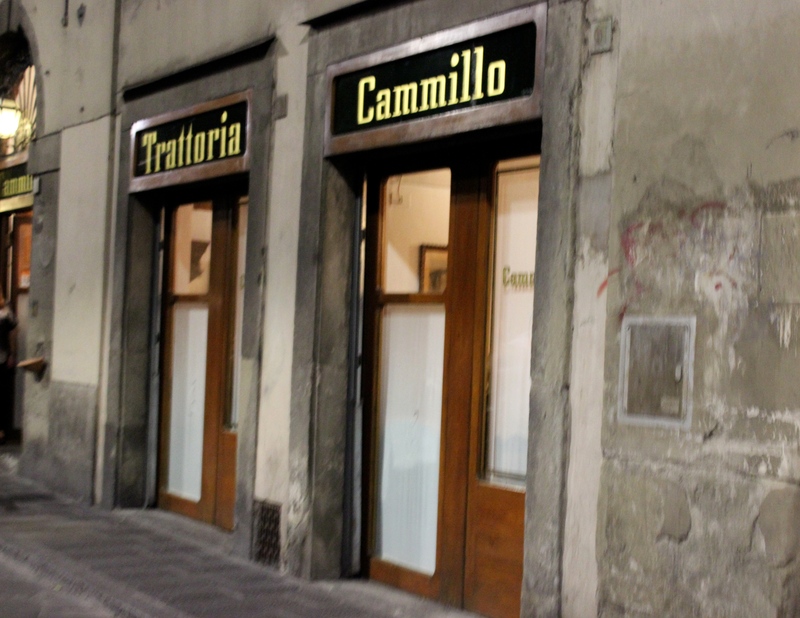 Cammillo’s lively atmosphere, gracious hosts, and excellent food prepared simply but with subtle hints of creative twists and flavors, is the perfect start to a wonderful week in Florence. 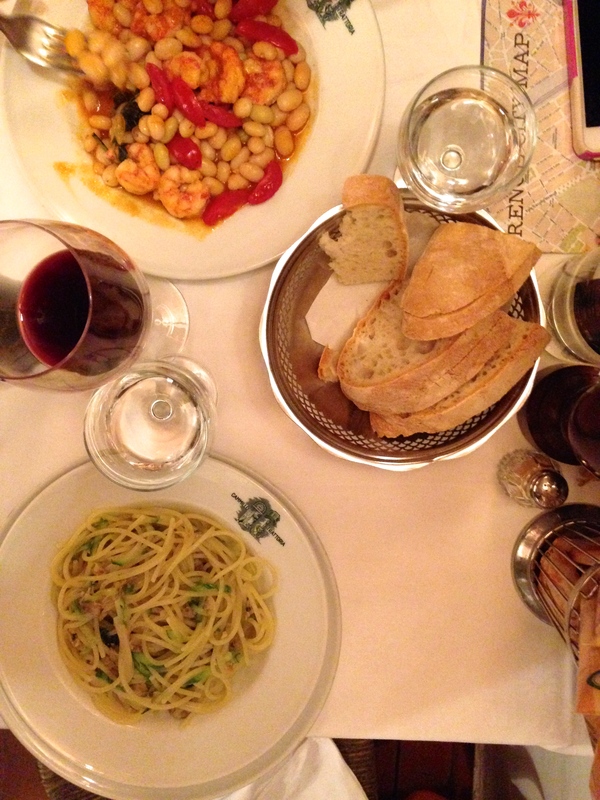 It is no wonder that the trattoria has been packed for nearly 80 years. Wall of cartoons at Cammillo. The first dining room at Cammillo: there are four separate rooms, one upstairs. At 7:30, those without a reservation begin a line at the door. Salami, beautiful local ficchi, and a small serving of a bready/figgy creation. 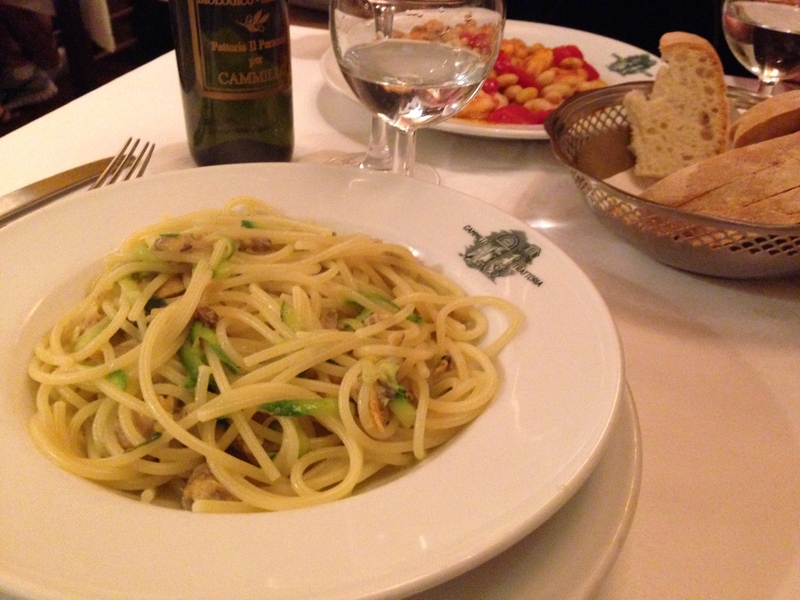 I chose one of the ‘piatti del giorno’ based on owner Chiara’s suggestion: linguine with sauce from three different varieties of clams and zucchini. Fagioli with pomodori and shrimp. The menu is extensive; it is insanely difficult to make a decision. I suggest ordering any or all of the six special plates of the day. They are guaranteed to be made with the freshest, seasonal ingredients. 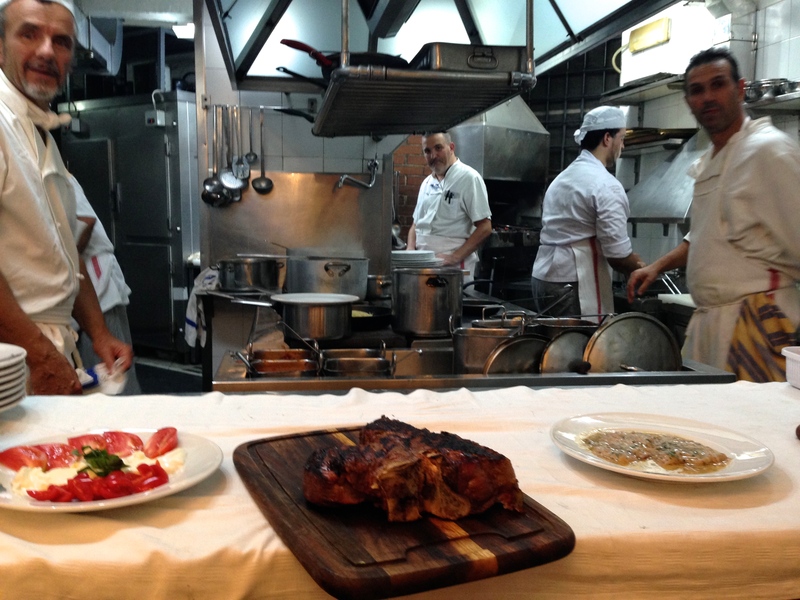 Cooks nella cucina, and a bistecca big enough to make the wooden table legs waver. At the pass at Cammillo. Meta e meta for dessert. We couldn’t decide between the fruit tarts, so we opted for half of each: schiacciata con l’uva (a tart grape crostata made with Sangiovese grapes) and frutti di bosco (wild berries). We devoured our halves so quickly, we decided to have the other halves. 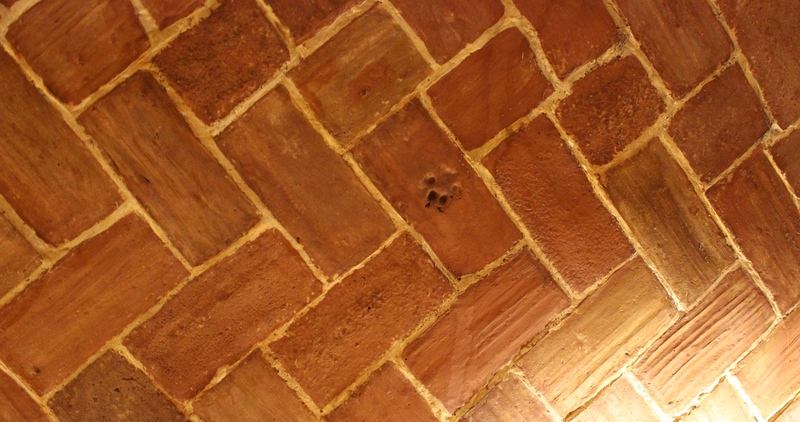 A piece of ancient history on the ceiling: when the bricks were still wet, a dog accidentally walked across one. A little bit of everything at Cammillo. Outside Cammillo in the Oltrarno.